Liver cancer-related death rates continue to accelerate worldwide.1,2 Numerous local techniques are evolving to address the growing burden of disease. These techniques include surgery (partial liver resection or liver transplant), ablation (radiofrequency, microwave, ethanol, cryoablation), and intra-arterial injections (chemoembolization, radioembolization, bland embolization). Systemic treatments, such as sorafenib, regorafenib, or nivolumab, are also expanding. An additional option is stereotactic ablative radiation therapy (SABR). SABR has harnessed innovations in external-beam radiation therapy delivery and toxicity modeling to safely and noninvasively deliver high radiation therapy doses to liver tumors in only 1 to 5 treatments. Here we review the indications, efficacy, toxicity and methods for SABR in liver tumors. While prospective comparative data is lacking between SABR and other local techniques, we suggest that SABR offers high local control, low toxicity, and ability to treat a range of tumor volumes and locations in a precise, noninvasive manner. While choice of local liver tumor therapy is currently institution-specific, future utilization of liver SABR promises to increase with experience and recognition. An advantage of SABR compared with other local techniques is that lesions can be treated that are difficult to access by RFA, embolization or surgery (eg, large volume tumors; disease complicated by portal thrombus;10 and lesions near the liver capsule, major vessels or diaphragm). In 2016, physicians from MD Anderson Cancer Center and Harvard analyzed outcomes from a series of unresectable ICC patients who received chemotherapy followed by moderately hypofractionated radiation therapy and identified a survival advantage with dose escalation.12 Patients treated to a biologically equivalent dose (BED) > 80.5 Gy had almost double the 3-year survival of those treated to lower doses (73% to 38%, respectively). The recent CLOCC trial (chemotherapy + local ablation vs chemotherapy) randomized 119 patients with liver-only colorectal unresectable metastatic disease to systemic therapy alone vs systemic therapy with RFA and surgical resection (when possible), and demonstrated a median OS benefit with local therapy (45.6 months vs 40.5 months).21 While no local ablative technique has demonstrated superiority compared to another local ablative technique in a randomized trial, Stintzing et al performed a matched comparative analysis of 60 patients with unresectable colorectal liver metastases, divided between SABR (24 to 26 Gy in 1 fraction) and RFA. One-year LC favored SABR (85%) compared to RFA (65%).22 This suggests that SABR could further enhance survival benefits for unresectable liver metastases compared to RFA. SABR also provides excellent control of oligometastatic liver disease from noncolorectal primaries. A 2016 series demonstrated 100% 2-year LC rates for 58 noncolorectal liver metastases.23 Additional studies of SABR for liver metastases are summarized in Table 2. In practice, the authors of this manuscript generally follow the isotoxicity approach initially proposed by Dawson et al and adapted into the Radiation Therapy Oncology Group (RTOG) 1112 trial (NCT01730937) protocol.24,25. In RTOG 1112, 5-fraction SABR is prescribed to Child-Turcotte-Pugh class (CTP) A HCC, and the mean liver dose (MLD, defined as liver minus gross tumor volume [GTV]) determines the prescription dose based on an expected 5% incidence of RILD. If the MLD in the achieved plan is less than 13 Gy, the dose is 50 Gy over 5 fractions; however, the dose is reduced as MLD increases. Caution must be employed for dose to adjacent stomach and bowel, and additional dose constraints are also provided within the RTOG 1112 protocol. Logically, this schema can also be applied to CTP A patients with liver metastases or cholangiocarcinoma, as BED10 = 100 Gy (50 Gy in 5 fractions) correlates with good tumor control.12,20 For patients with limited liver metastatic disease without underlying liver dysfunction, 60 Gy in 5 fractions (BED10 = 132 Gy) can be considered. Conversely, caution must be used in CTP B patients. A phase I/II trial reported 38% grade 3 or higher toxicities for CTP B HCC patients treated with SABR.26 The use of dose escalation in this fragile population requires careful patient selection. For CTP C patients, hospice should be considered. Since increasing MLD correlates with increasing rates of RILD and limits prescription dose and anticipated tumor control, attempts should be made to reduce the MLD.27,28 Custom immobilization, image guidance and respiratory management allow reduction of the planning target volume (PTV) margin to about 5 mm. Patients with limited respiratory motion assessed by fluoroscopy, 4-dimensional computed tomography (4D-CT), or cine magnetic resonance imaging (MRI) could be treated with an internal target volume (ITV) encompassing the respiratory excursion plus PTV expansion for setup uncertainty. However, craniocaudal and anterior-posterior excursions of liver tumors of 2 to 3 cm have been reported with limited motion reduction by abdominal compression.29 Therefore, appropriate motion management techniques must be available to treat patients with large respiratory motions. Example strategies include respiratory gating, breath-hold and active tracking.30-32 Such systems include the Cyberknife Synchrony (Accuray, Sunnyvale, California) and Varian Real-Time Position Management (Varian, Palo Alto, California) systems, which use cameras during therapy to track markers placed on the body’s surface that are correlated to the internal tumor position. A common alternative is Elekta’s Active Breathing Coordinator (Elekta, Stockholm, Sweden), which tracks and assists reproducible lung filling during treatment. Definition of the target requires intravenous (IV) contrast at the time of simulation and/or careful fusion to diagnostic scans. If gating or breath-hold is employed, simulation must include images for planning in that respiratory phase. RILD is the most common dose-limiting toxicity for radiation therapy of liver tumors with time-to-onset ranging from 2 weeks to 8 months post-treatment. Classical RILD is characterized by fatigue, anicteric ascites, elevation of alkaline phosphatase out of proportion to other live enzymes, abdominal pain, and hepatomegaly. Nonclassical RILD patients present with jaundice and elevated serum transaminase. Given the overlap with liver failure of other causes, such as hepatitis, it is often difficult to directly ascribe to radiation therapy. Management is supportive, similar to management of other types of liver injury. Numerous studies support SABR for the treatment of liver tumors such as unresectable hepatocellular carcinoma, intrahepatic cholangiocarcinoma, and liver metastases. Careful consideration of image guidance and respiratory management allows for minimization of normal liver treated, improving the safety, effectiveness, and size and number of tumors that can be treated successfully. Comparative studies to other techniques, improving radiation therapy delivery technologies, and expanding indications, such as bridge to transplant in HCC or oligometastatic liver disease, may increase future utilization of liver SABR. Ryerson AB, Eheman CR, Altekruse SF, et al. Annual Report to the Nation on the Status of Cancer, 1975-2012, featuring the increasing incidence of liver cancer. Cancer. 2016;122(9):1312-1337. Siegel RL, Miller KD, Jemal A. Cancer statistics, 2018. CA: Cancer J Clin. 2018;68(1):7-30. Massarweh NN, El-Serag HB. Epidemiology of hepatocellular carcinoma and intrahepatic cholangiocarcinoma. Cancer Control. 2017;24(3):107327481772924. Jarnagin W, Chapman WC, Curley S, et al. Surgical treatment of hepatocellular carcinoma: expert consensus statement. HPB (Oxford) 2010;12(5):302-310. Sapisochin G, Barry A, Doherty M, et al. Stereotactic body radiotherapy vs. TACE or RFA as a bridge to transplant in patients with hepatocellular carcinoma. An intention-to-treat analysis. J Hepatol, 2017;67(1):92-99. El-Serag HB, Rudolph KL. Hepatocellular carcinoma: epidemiology and molecular carcinogenesis. Gastroenterology.2007;132(7):2557-2576. Wahl DR, Stenmark MH, Tao Y, et al. Outcomes after stereotactic body radiotherapy or radiofrequency ablation for hepatocellular carcinoma. J Clin Oncol. 2016;34(5):452-459. Sapir E, Tao Y, Schipper MJ, et al. Stereotactic body radiation therapy as an alternative to transarterial chemoembolization for hepatocellular carcinoma. Int J Radiat Oncol Biol Phys. 2018;100(1):122-130. Xi M, Zhang L, Zhao L, et al. Effectiveness of stereotactic body radiotherapy for hepatocellular carcinoma with portal vein and/or inferior vena cava tumor thrombosis. PLoS ONE, 2013;8(5):e63864. Endo I, Gonen M, Yopp AC, et al. Intrahepatic cholangiocarcinoma: rising frequency, improved survival, and determinants of outcome after resection. Ann Surg. 2008;248(1):84-96. Tao R, Krishnan S, Bhosale PR, et al. Ablative radiotherapy doses lead to a substantial prolongation of survival in patients with inoperable intrahepatic cholangiocarcinoma: A retrospective dose response analysis. J Clin Oncol. 2016;34(3):219-226. Tse, RV, Hawkins M, Lockwood G, et al. Phase I study of individualized stereotactic body radiotherapy for hepatocellular carcinoma and intrahepatic cholangiocarcinoma. J Clin Oncol. 2008;26(4):657-664. Sheth KR, Clary BM. Management of hepatic metastases from colorectal cancer. Clin Colon Rectal Surg. 2005;18(03):215-223. Weichselbaum RR, Hellman S. Oligometastases revisited. Nat Rev Clin Oncol. 2011;8(6):378-382. Van Cutsem E, Cervantes A, Adam Ret al. ESMO consensus guidelines for the management of patients with metastatic colorectal cancer. Ann Oncol. 2016;27(8):1386-1422. Comito T, Cozzi L, Clerici E. Stereotactic ablative radiotherapy (SABR) in inoperable oligometastatic disease from colorectal cancer: a safe and effective approach. BMC Cancer, 2014;14(1):619. Scorsetti M, Comito T, Tozzi A, et al. Final results of a phase II trial for stereotactic body radiation therapy for patients with inoperable liver metastases from colorectal cancer. J Cancer Res Clin Oncol. 2014;141(3):543-553. Rusthoven KE, Kavanagh BD, Cardenes H, et al. Multi-institutional phase I/II Trial of stereotactic body radiation therapy for liver metastases. J Clin Oncol. 2009;27(10):1572-1578. Fode MM, Hoyer M. Survival and prognostic factors in 321 patients treated with stereotactic body radiotherapy for oligo-metastases. Radiother Oncol. 2015;114(2):155-160. Ruers T, Van Coevorden F, Punt CJ, et al. Local treatment of unresectable colorectal liver metastases: results of a randomized phase II trial. J Natl Cancer Inst. 2017;109(9). Stintzing S, Grothe A, Hendrich S, et al. Percutaneous radiofrequency ablation (RFA) or robotic radiosurgery (RRS) for salvage treatment of colorectal liver metastases. Acta Oncologica. 2013;52(5):971-977. Ahmed KA, Caudell JJ, El-Haddad G, et al. Radiosensitivity differences between liver metastases based on primary histology suggest implications for clinical outcomes after stereotactic body radiation therapy. Int J Radiat Oncol Biol Phys. 2016;95(5):1399-1404. Dawson LA, Eccles C, Craig T. Individualized image guided iso-NTCP based liver cancer SBRT. Acta Oncol. 2006;45(7):856-864. Lasley FD, Mannina EM, Johnson CS, et al. Treatment variables related to liver toxicity in patients with hepatocellular carcinoma, Child-Pugh class A and B enrolled in a phase 1-2 trial of stereotactic body radiation therapy. Pract Radiat Oncol. 2015;5(5):e443-449. Ten Haken RK, Balter JM, Marsh LH, et al. Potential benefits of eliminating planning target volume expansions for patient breathing in the treatment of liver tumors. Int J Radiat Oncol Biol Phys. 1997;38(3):613-617. Wagman R, Yorke E, Ford E, et al. Respiratory gating for liver tumors: use in dose escalation. Int J Radiat Oncol Biol Phys. 2003;55(3):659-668. Eccles CL, Patel R, Simeonov AK, et al. Comparison of liver tumor motion with and without abdominal compression using cine-magnetic resonance imaging. Int J Radiat Oncol Biol Phys. 2011;79(2):602-608. Dawson LA, Brock KK, Kazanjian S, et al. The reproducibility of organ position using active breathing control (ABC) during liver radiotherapy. Int J Radiat Oncol Biol Phys. 2001;51(5):1410-1421. Law AL, Ng WT, Lee MC, et al. Treatment of primary liver cancer using highly-conformal radiotherapy with kV-image guidance and respiratory control. Radiother Oncol. 2012;102(1):56-61. Winter JD, Wong R, Swaminath A, Chow T. Accuracy of robotic radiosurgical liver treatment throughout the respiratory cycle. Int J Radiat Oncol Biol Phys. 2015;93(4):916-924. Kothary N, Heit JJ, Louie JD, et al. Safety and efficacy of percutaneous fiducial marker implantation for image-guided radiation therapy. J Vasc Interv Radiol. 2009;20(2):235-239. Wunderink W, Méndez Romero A, Seppenwoolde Y, et al. Potentials and limitations of guiding liver stereotactic body radiation therapy set-up on liver-implanted fiducial markers. Int J Radiat Oncol Biol Phys. 2010;77(5):1573-1583. Yue J, Sun X, Cai J, et al. Lipiodol: a potential direct surrogate for cone-beam computed tomography image guidance in radiotherapy of liver tumor. Int J Radiat Oncol Biol Phys. 2012;82(2):834-841. Mutic S, Dempsey JF. The ViewRay system: magnetic resonance-guided and controlled radiotherapy. Semin Radiat Oncol. 2014;24(3):196-199. Kishan AU, Cao M, Wang PC, et al. Feasibility of magnetic resonance imaging-guided liver stereotactic body radiation therapy: A comparison between modulated tri-cobalt-60 teletherapy and linear accelerator-based intensity modulated radiation therapy. Pract Radiat Oncol. 2015;5(5):330-337. Wojcieszynski AP, Rosenberg SA, Brower JV, et al. 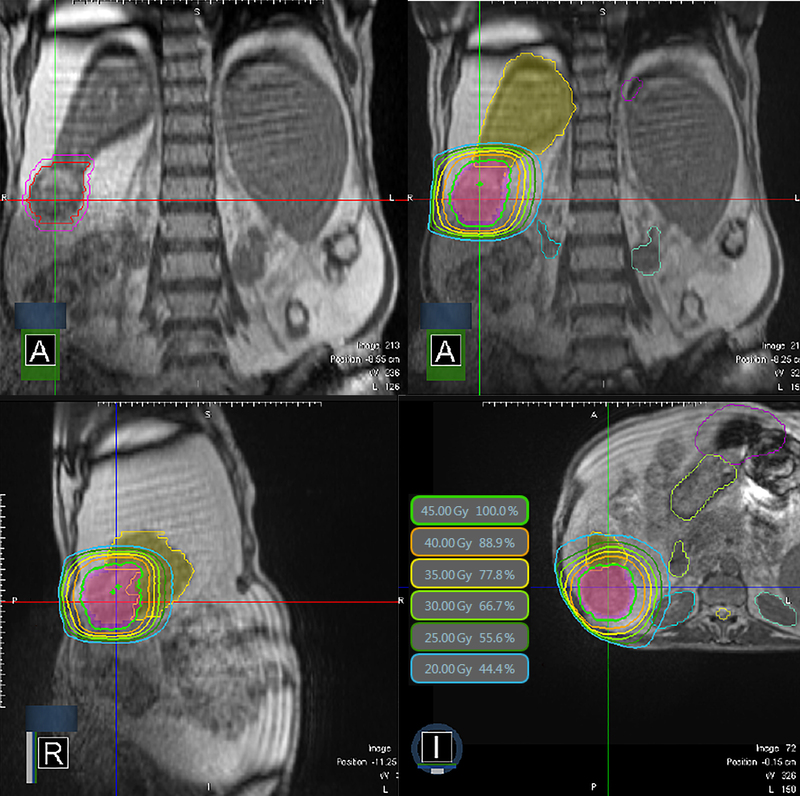 Gadoxetate for direct tumor therapy and tracking with real-time MRI-guided stereotactic body radiation therapy of the liver. Radiother Oncol. 2016;118(2):416-418. Hong TS, Wo JY, Borger DR, et al. Phase II study of proton-based stereotactic body radiation therapy for liver metastases: importance of tumor genotype. J Natl Cancer Inst. 2017;109(9). Petersen JB, Lassen Y, Hansen AT, et al. Normal liver tissue sparing by intensity-modulated proton stereotactic body radiotherapy for solitary liver tumours. Acta Oncol. 2011;50(6):823-828. Hong TS, DeLaney TF, Mamon HJ et al. A prospective feasibility study of respiratory-gated proton beam therapy for liver tumors. Pract Radiat Oncol. 2014;4(5):316-22. Nakayama H, Sugahara S, Tokita M, et al. Proton beam therapy for hepatocellular carcinoma: the University of Tsukuba experience. Cancer. 2009;115(23):5499-5506. El Naqa I, Cuneo K, Owen D, et al. Radiation sensitivity of the liver: models and clinical data. In: Meyer J, Schefter T, eds. Radiation therapy for liver tumors. 1st ed. Cham, Switzerland: Springer International Publishing. 2017:39-47. Pan CC, Kavanagh BD, Dawson LA, et al. Radiation-associated liver injury. Int J Radiat Oncol Biol Phys. 2010;76(3 Suppl):S94-100. Klein J, Dawson LA, Jiang H, et al. Prospective longitudinal assessment of quality of life for liver cancer patients treated with stereotactic body radiation therapy. Int J Radiat Oncol Biol Phys. 2015;93(1):16-25. Huertas A, Baumann AS, Saunier-Kubs F, et al. Stereotactic body radiation therapy as an ablative treatment for inoperable hepatocellular carcinoma. Radiother Oncol. 2015;115(2):211-216. Sanuki N, Takeda A, Oku Y, et al. Stereotactic body radiotherapy for small hepatocellular carcinoma: a retrospective outcome analysis in 185 patients. Acta Oncologica. 2013;53(3):399-404. Yoon SM, Lim YS, Park MJ, et al. Stereotactic body radiation therapy as an alternative treatment for small hepatocellular carcinoma. PLoS ONE. 2013;8(11):e79854. Bujold A, Massey CA, Kim JJ, et al. Sequential phase i and ii trials of stereotactic body radiotherapy for locally advanced hepatocellular carcinoma. J Clin Oncol. 2013;31(13):1631-1639. Andolino DL, Johnson CS, Maluccio M, et al. Stereotactic body radiotherapy for primary hepatocellular carcinoma. Int J Radiat Oncol Biol Phys. 2011;81(4):e447-e453. O’Connor JK, Trotter J, Davis GL, et al. Long-term outcomes of stereotactic body radiation therapy in the treatment of hepatocellular cancer as a bridge to transplantation. Liver Transpl. 2012;18(8):949-954. Cárdenes HR, Price TR, Perkins SM, et al. Phase I feasibility trial of stereotactic body radiation therapy for primary hepatocellular carcinoma. Clin Translat Oncol. 2010;12(3):218-225. Meyer JJ, Foster RD, Lev-Cohain N, et al. A phase 1 dose-escalation trial of single-fraction stereotactic radiation therapy for liver metastases. Ann Surg Oncol. 2015;23(1):218-224. Goodman KA, Wiegner EA, Maturen KE, et al. Dose-escalation study of single-fraction stereotactic body radiotherapy for liver malignancies. Int J Radiat Oncol Biol Phys. 2010;78(2):486-493. Lee MT, Kim JJ, Dinniwell R, et al. Phase I study of individualized stereotactic body radiotherapy of liver metastases. J Clin Oncol. 2009;27(10):1585-1591. Spieler BO, Portelance L, Mellon EA. Stereotactic ablative radiation therapy in the treatment of liver tumors. Appl Rad Oncol. 2018;7(1):17-23. Dr. Spiele is a resident, Dr. Portelance is an associate professor, and Dr. Mellon is an assistant professor, Department of Radiation Oncology, Sylvester Comprehensive Cancer Center, Miller School of Medicine, University of Miami, Miami, FL. Disclosure: Dr. Mellon has received travel funding from ViewRay, Oakwood Village, OH.